You haven’t heard from me for a long time, because I switched most of my efforts over to another blog at Growing up Goofy. I couldn’t keep up with the amount of deals and coupons that I found on a daily basis. So I refocused on my family, DIY projects, and all things Disney. I’m giving away a $50 Disney gift card to one lucky person. All you need to do is subscribe to my new Growing up Goofy newsletter, and you’ll automatically be entered to win. However, this only runs until August 31st, so you only have a few more days to subscribe to be entered. Normally, my newsletter will be delivered once per week. But for the first month, I’m sending out 30 days of Disneyland tips. You’ll receive one tip perday for the month of September. Once October hits, the newsletter will resume a weekly schedule. I hope you consider joining me on this journey that’s already well underway. Head over to GrowingupGoofy.com for more news, DIY projects, and Disney info. And don’t forget to subscribe to the newsletter before August 31st if you’d like to enter the giveaway. Here is a coupon code to get an additional 20% off your purchase at the Disney Store. Use coupon code THANKS at checkout to get 20% off. Plus you’ll get free shipping with any purchase of $75 or more. They have a lot of items up to 50% off. This offer ends tonight so head over to the Disney Store and check out their sale before it ends! The Disney Store is having a hot sale on Kids PJ’s. 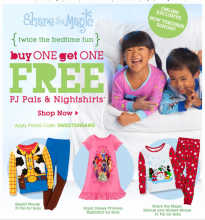 Right now you can get Disney PJ’s B1G1 FREE! Prices start at $16.50 so you’ll get two pairs for the price of one! I’ve bought several princess nightshirts for our daughter. We use these for “dress up” instead of the fancy (expensive) dresses because they aren’t covered in glitter! Use code SWEETDREAMS at checkout to get this B1G1 FREE offer. Disney Store: B1G1 Free Mix and Match Sale! The Disney Store is having a great sale this week. Buy one get one free mix and match on most plush toys and sleep wear. Hurry over to the Disney Store and check it out. Most of the holiday plush toys are already on sale so you can get a really great deal with this offer! Offers Dec 13, 2010 in Disney, free, holiday · Expired! 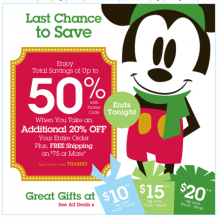 Disney Store: Toy Mania Sale plus FREE shipping! The Disney Store is having a Toy Mania Sale! Plus, get free shipping when you buy any Disney Toy! Use code: TOYMANIA at check out. Offers Dec 6, 2010 in Disney, kids, toys · Expired! Our daughter is really into Minnie Mouse right now. I sent my mom on a hunt for Minnie Mouse slippers yesterday. She found them at the Disney Store, along with a small plush Minnie and Mickey Mouse! She couldn’t resist them because they were buy one, get one free! If you are looking for Disney plus toys, head over to the Disney Store for B1G1 FREE toys! Offer ends 12/5. Offers Nov 30, 2010 in Disney, kids, toys · Expired! Our daughter loves Mickey Mouse, actually she loves Minnie Mouse. The only way we could get her to put on her Halloween costume this year was by telling her Minnie was a Witch this year too. (See episode Mickey’s Treat) That seemed to work. Now you can get a really cute fleece throw blanket, personalized, for only $12. Check it out at the Disney Store. Free shipping and personalization with code FLEECE at checkout! Head over to the Disney Store and get a free lunch tote with any backpack purchase. Plus, you can get free shipping with any Back-To-School item purchase. Offer good through August 8th. Offers Jul 28, 2010 in backtoschool, Disney · Expired! New Disney DVD Coupons and Mail In Rebate! Good Deal Mama has a great way to get the New Disney DVD for a great deal! Our daughter just started watching Pooh and Friends so we can’t wait! Here are two really great coupons. Plus, there is a $5 mail in rebate available too. Here is a $5 mail in rebate available through 5/31! Just purchase any Pedialyte product and a Disney My Friends Tigger and Pooh DVD! There is also a buy one, get one free coupon for Pedialyte or grab your coupon from the 3/7 SS! Coupons Apr 22, 2010 in Disney, kids · Expired! Hurry over to the Disney Store and buy one, get one free plush toys. This offer is only good for a couple more days while supplies last. Offers Feb 9, 2010 in Disney, free · Expired!